March 2, 2013: This website is very new and replaces one I've had for three years. I was sort of forced into getting a new host because Posterous, which I was using and loved, notified its members that they would shut down as of April 30, 2013. That means my website would be shut down and so I've been working on this new one pretty much every day over the last few weeks. So much more to do! I will be adding to this page with more commission work that I've done in the past and because of that, this is a work in progress! 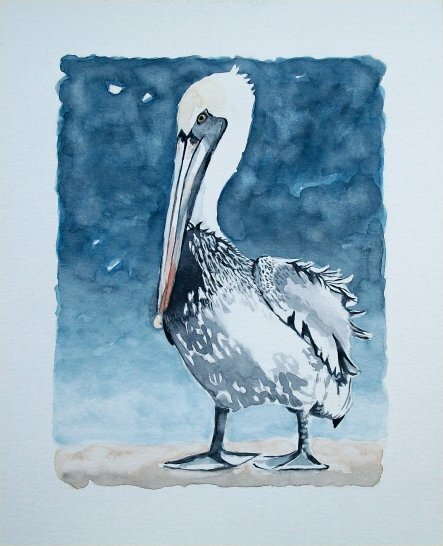 I generally leave the white of the paper as a border around the commissioned painting. It is part of my signature style. 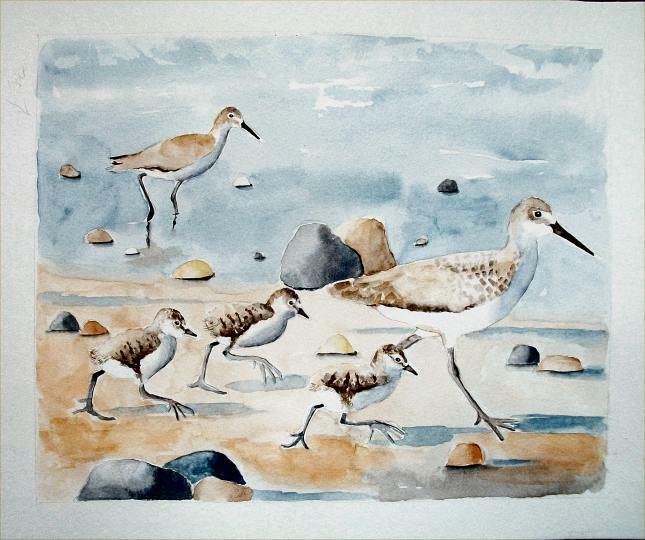 The above three paintings are commissions for a client in the states... a very special family! 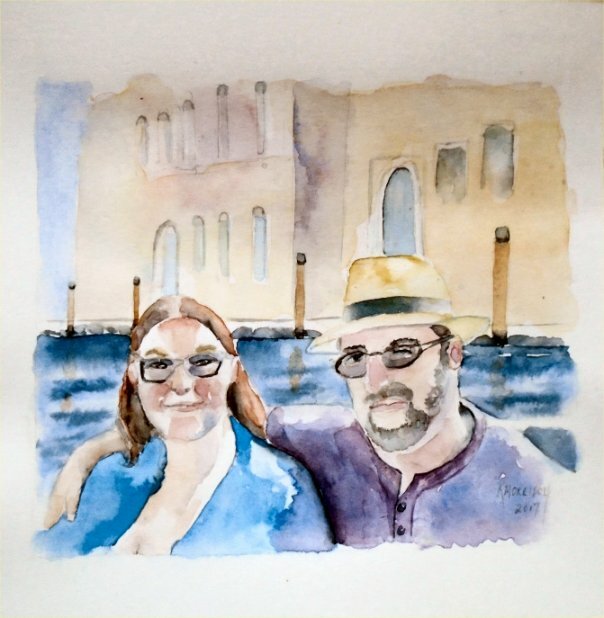 Above is a commission painting for a client of her niece & husband while they were in Venice. The painting was a wedding present.. Above is a commission painting I did Sept 2017 of the clients grandchildren. She was pleased with the results! 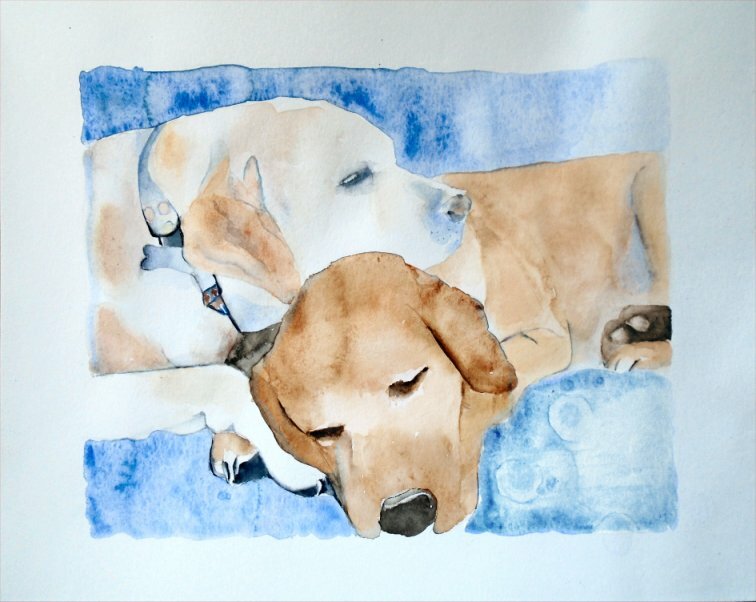 The painting below is a recent commission for a client of his two beautiful Labs... Izzie & Addie... The client felt it was perfect. 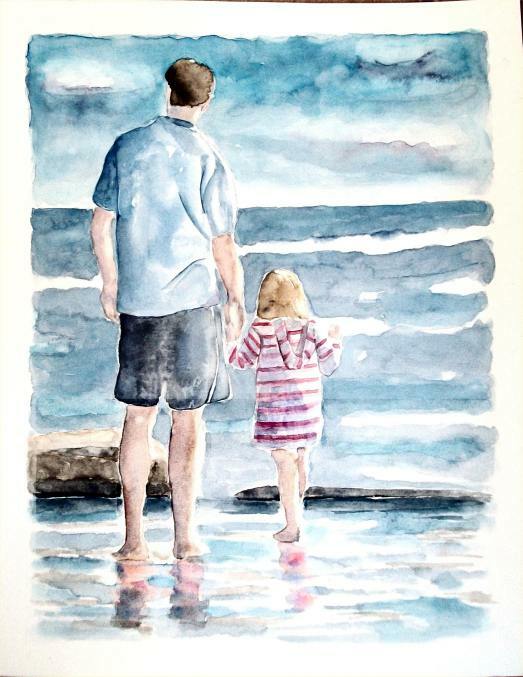 Above is a recent 11" x 14"commission of a mother with her two daughters together at a beach. April 2016. 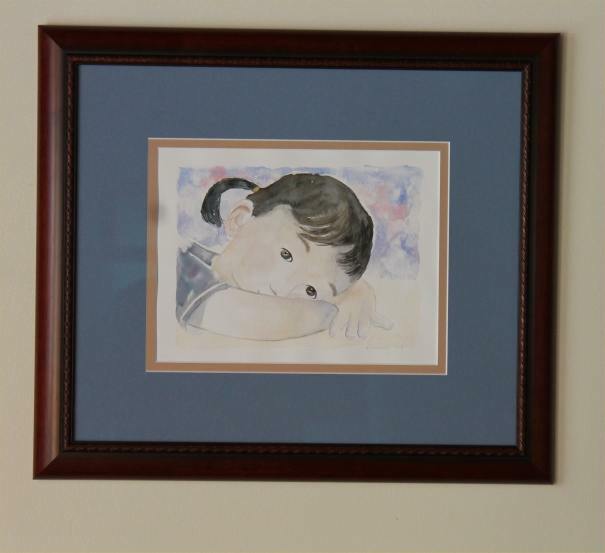 I received the watercolor today and it is perfect! 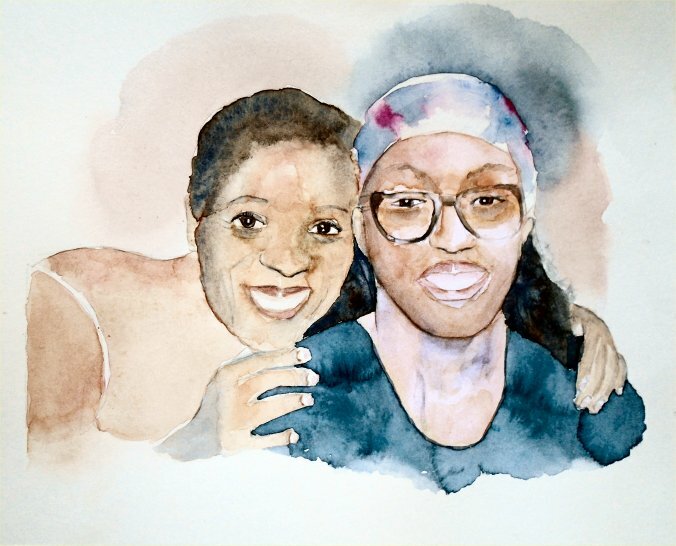 I am so excited about it that I can't decide if I want to send it to her for Mother's Day this weekend, or wait for her 60th birthday which is in June. Thanks so much; I'll try to send you a picture of it once it is framed. 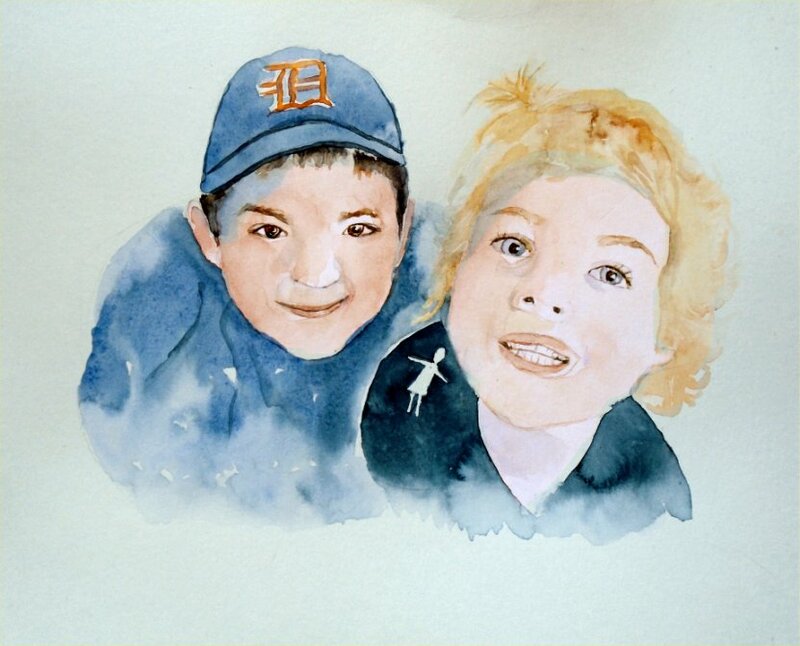 ​Above is a painting Of grandchildren I did for a friend! Hi Karen. 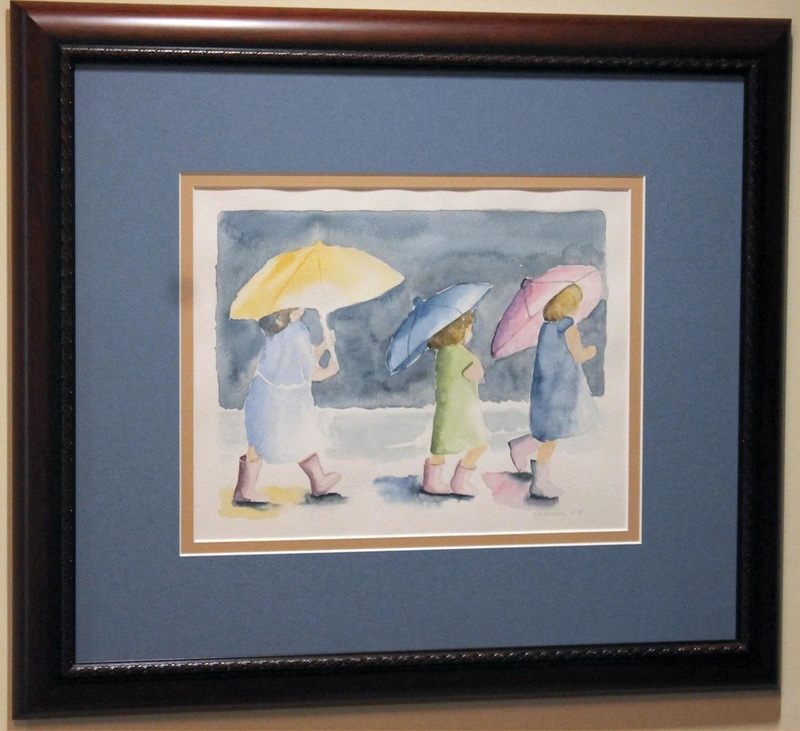 I am writing concerning the watercolor called "comfort in friendship". Long story short but this photo was attached to a letter my sons best friend wrote to him at school. It is so beautiful as it reminds me of my son and his best friend. I would love to purchase a copy of his piece. Can you tell me how I can go about that ? Hi Lisa, Thank you for contacting me. : ) yes, that piece has meant a lot to others too as I think the poses & body language really speak to us.. I have recently sketched it again in two sizes on 140 lb. watercolor paper... 8” x 10” and 11” x 14” and plan to paint them soon. Hello Karen. Thank you so much for responding so quickly. I certainly would love an original in the 11x14 size. I'm in no hurry I'm just glad I was able to tract you down so quickly. Do you have a Facebook page I could follow you on ? I posted on my page that I was looking for the artist of the piece, and once I found you I had to post that also. You just let me know when to get a payment to you. Above are two 5" x 7" commission pieces for a client in Germany. On the left is "Comfort in Friendship" and the painting on the right is "Friendship in the City". I painted them as companion pieces. I am Christine from Hamburg, Germany. 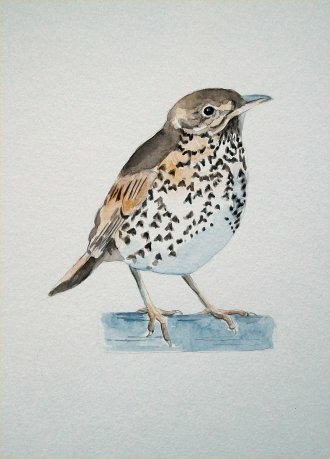 I recently came across one of your watercolours and I absolutely fell in love with one in particular (they are all beautiful!). You don't have it on your website, I actually found it on a Goodreads review page. It's 2 boys walking on a beach, so it looks, and one of them has his arm around the other's shoulder. Both are wearing blue T-shirts. One of them is wearing a blue the other one a brownish pair of trousers. 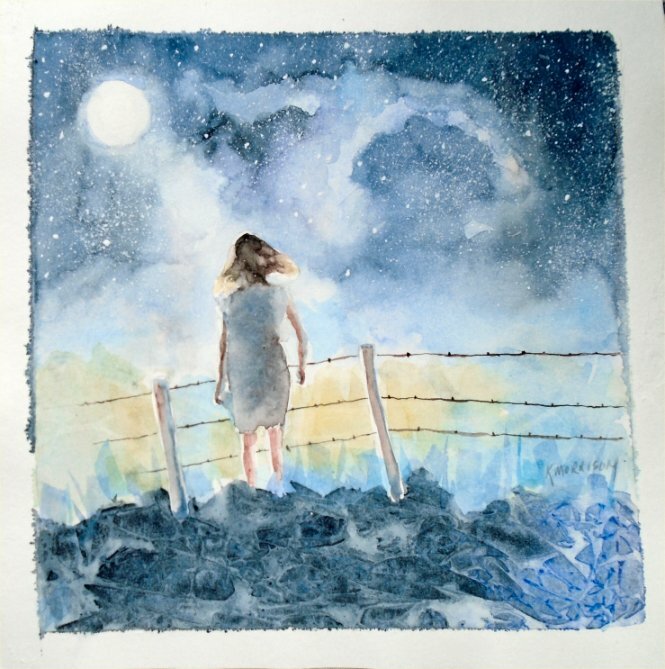 Would there be any chance to buy a print or even the picture? I'd really love to. "Hi Karen, Thank you so much for your fast reply. Yes, that's exactly the painting I was referring to. It's so beautiful - the way the left boy holds the other boy and the way the right boy's arm touches his friend... You captured friendship perfectly! And the colours are just right, too! I am so happy to have located you. 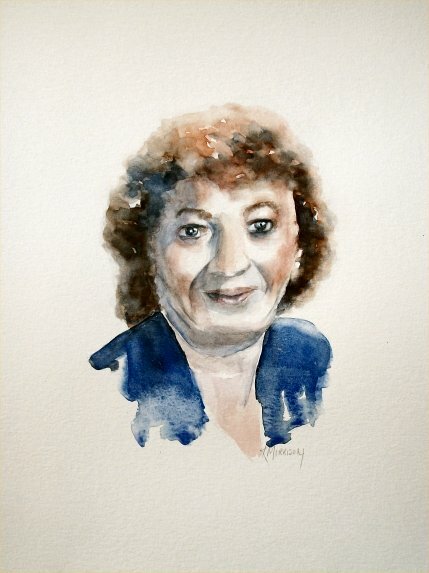 I especially love your "people" watercolours." "Dear Karen! The pictures arrived today! Safe and sound and absolutely beautiful. I'll get frames for them tomorrow and hang them on the wall straight away. So lovely, thank you so very much! I am really happy." beautiful and vibrant, in a delicate way. Love it!! Thank you so much for your kind words. : ).. 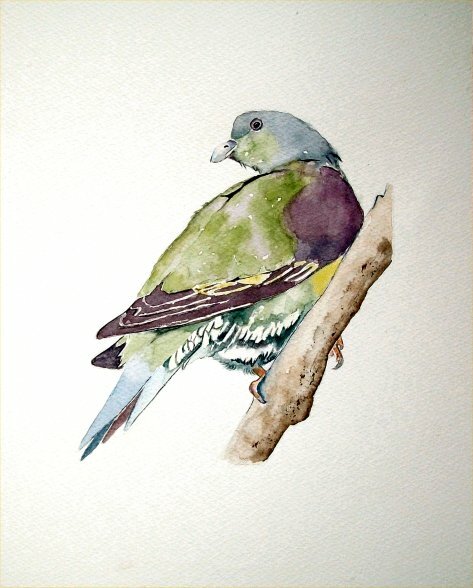 I do a lot of painting and especially a lot of birds in Watercolor these days. 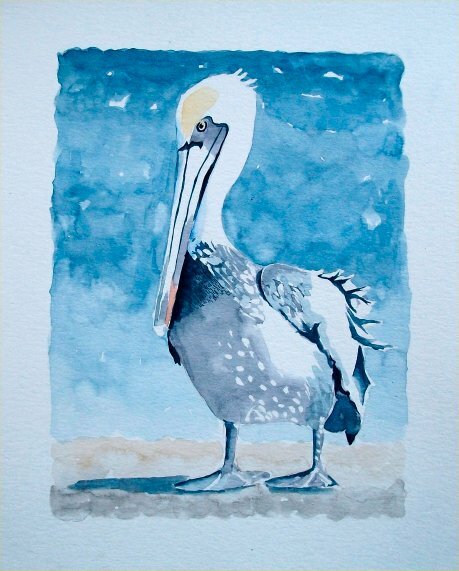 : ) The largest size I do for mailing is 11”x 14” or 27.94 cm x 35.56 cm. It’s a nice size to work when painting a couple of people walking on the beach. The cost is $200.00 US funds. 5" x 7" Painting of a little Wren on top of my client's mother's wren house! 9" x 12" Painting Commission "Angela's Nan"
8" x 10" Painting/Line Drawing of friends of ours when they were first married. 9" x12" Line Drawing/Wash entitled "Papa in Uniform". 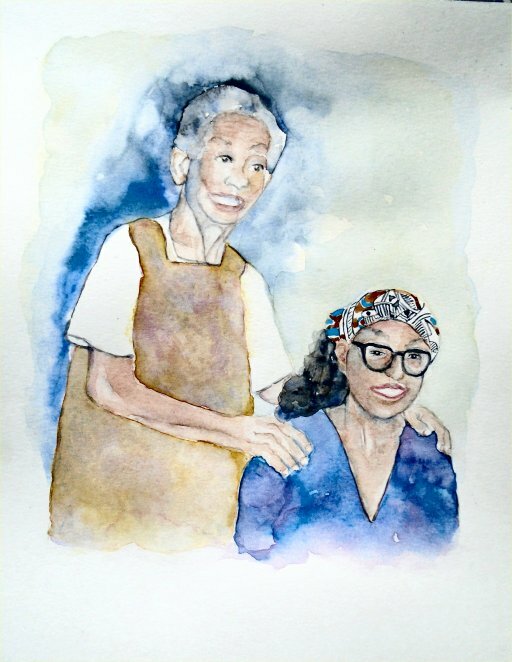 Below are two 5" x 7" Commission paintings of a Grandmother and her Granddaughter. I think of them as companion pieces. 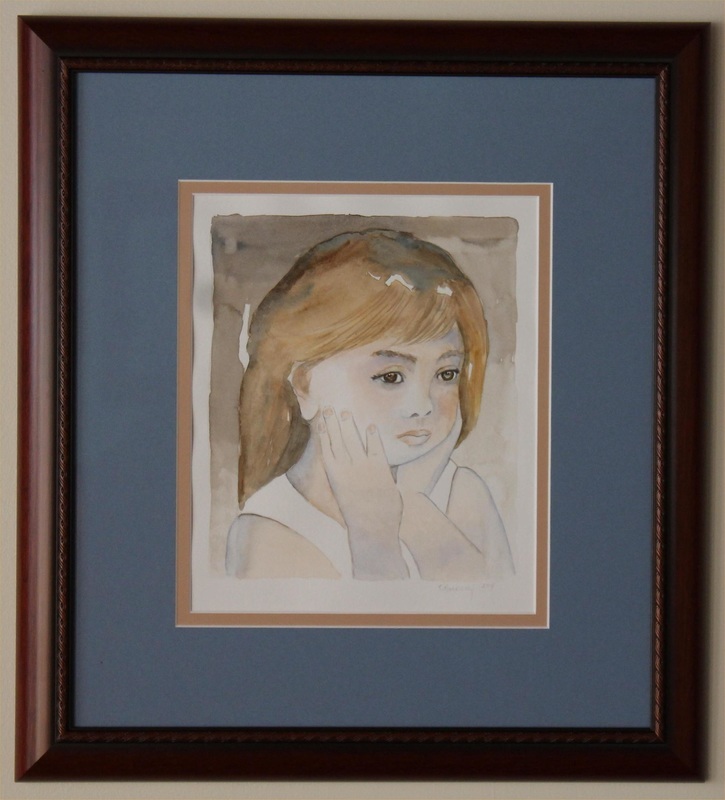 My painting that was used on a family history book cover. 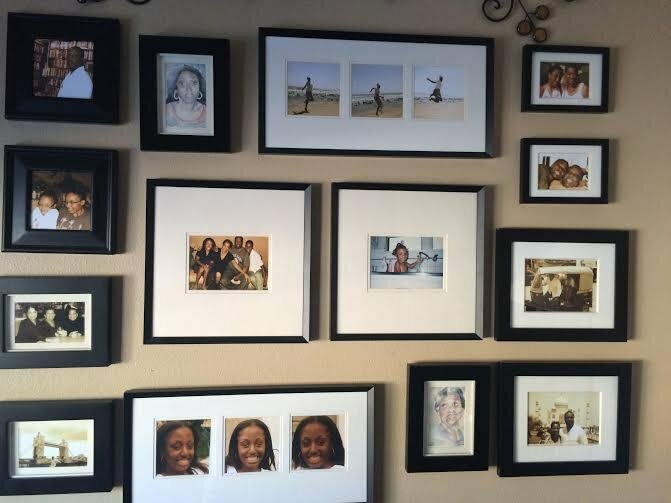 Below are photos of the paintings/pictures arrangements on their wall. This is a 10"x14"commissioned painting of a client's two beloved pets, wired haired terriors. 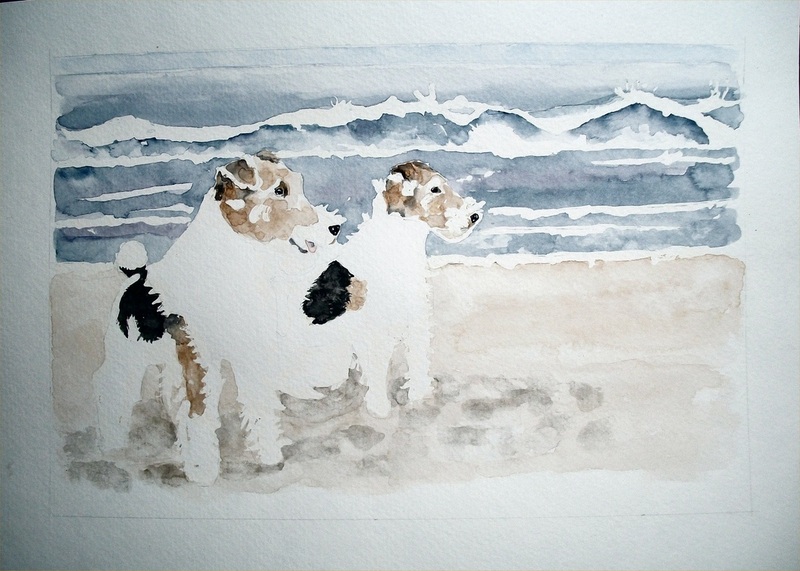 I like the stance of the dogs against the wave action in the background. 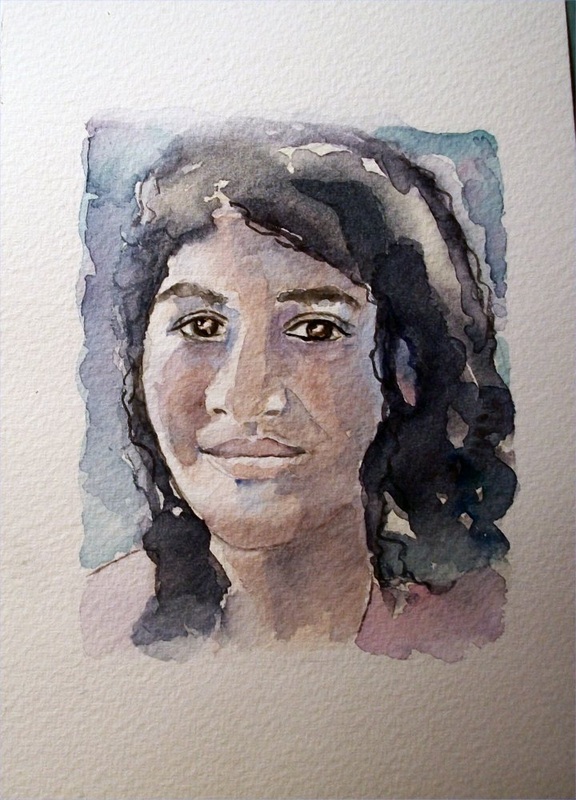 This is an 8"x10" portrait of a client's daughter. I tried to bring lots of light and warmth into the painting. 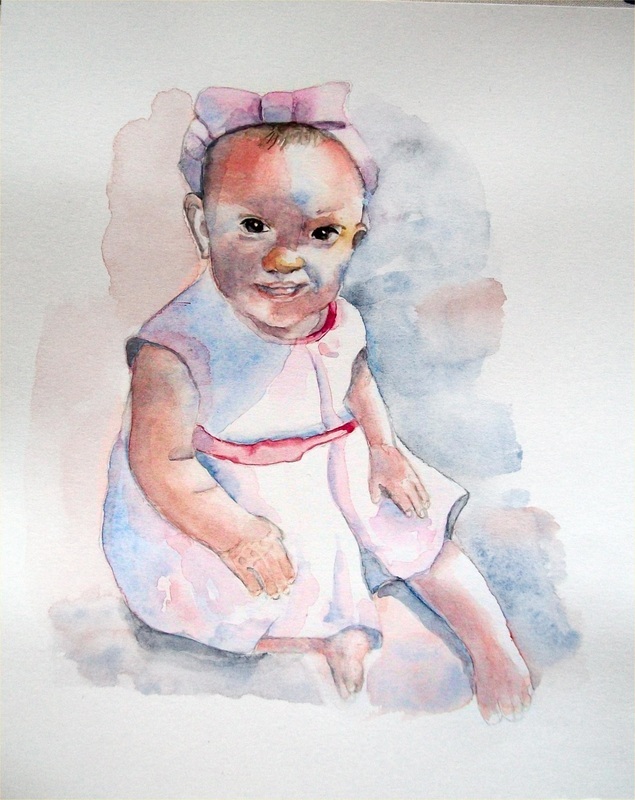 "Dakota" This is an 8"x10" portrait painting of a niece of a client. One side of her face and her arm is flooded with light, with shade on the other side. I've tried to keep the painting very fluid. This is the 5"x7" commission painting I did for him. your paintings in our store. 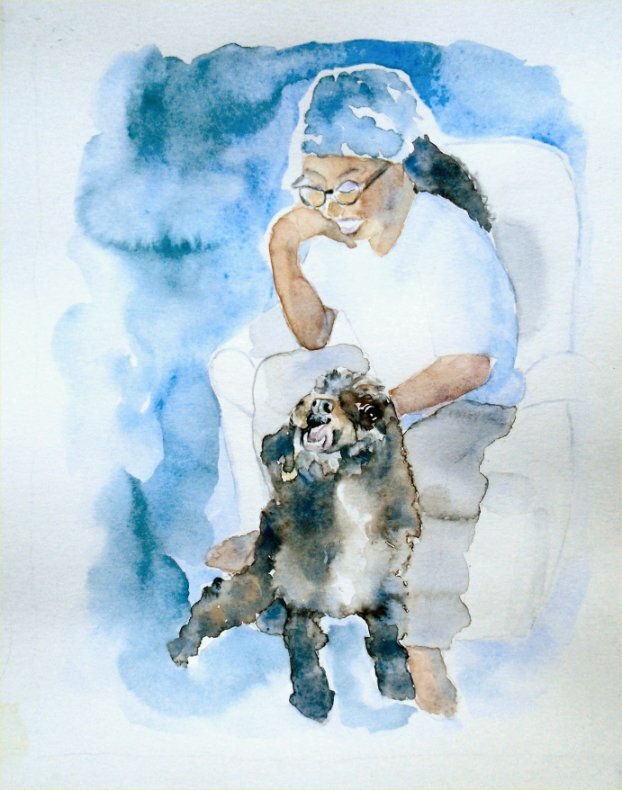 I told my boss of your lovely works of art, and she too would like to feature your work.....LATER: If you can give me an idea as to what the subjects will be for the three other commission paintings I will pass this on to my boss. It would be wonderful if you could possibly do one of a large sunflower head with one or more chickadees picking at it. We are hoping to rotate them depending on the season. 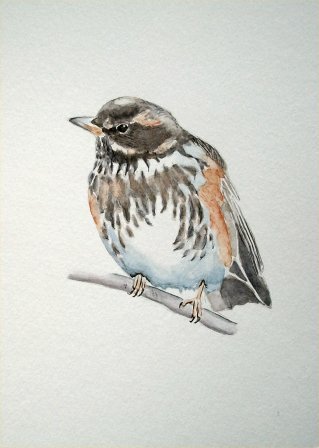 Another idea would be of a winter scene with birch trees blanketed in snow and a few of your plump little chickadees. Also, baby birds trailing along beside mom at the beach would be cute for our summer look. I’m sure you have some wonderful ideas, and will look forward to hearing your thoughts!" A little chickadee all puffed up in the cold. 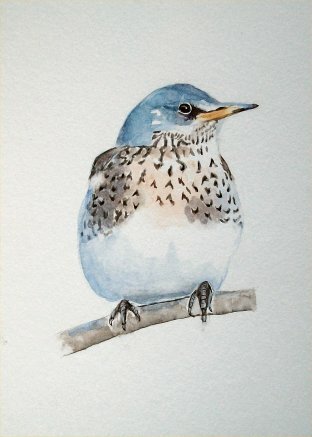 I call this commission painting "Snow Chickadee". It is 14" x 14" painting and it is going to a little shop in BC. Two little Chickadees on a sunny fall day, one clinging to a Sunflower and the other perched on top of another Sunflower. I call this 11" x 14" painting " Sunflowers and Chickadees" and it is also going to the little shop in BC. This is a little Piping Plover family and the chicks, their feathers wet from the water, are scurrying after their mother! I call this 11" x 14" painting, "Wait for Me!" One little chick is trying to dry and air out his feathers, before resuming his run! This is the last of three paintings that are going to BC. A commission 11" x 14" Painting "Izzy and Her Ball" painted from a photo of this Golden Lab for a client in Tennessee. I asked for a photo either as the sun was setting or as it was rising and low in the sky. I like the warmth and shadows created at these times of day because you can have so much light and contrast in the painting! 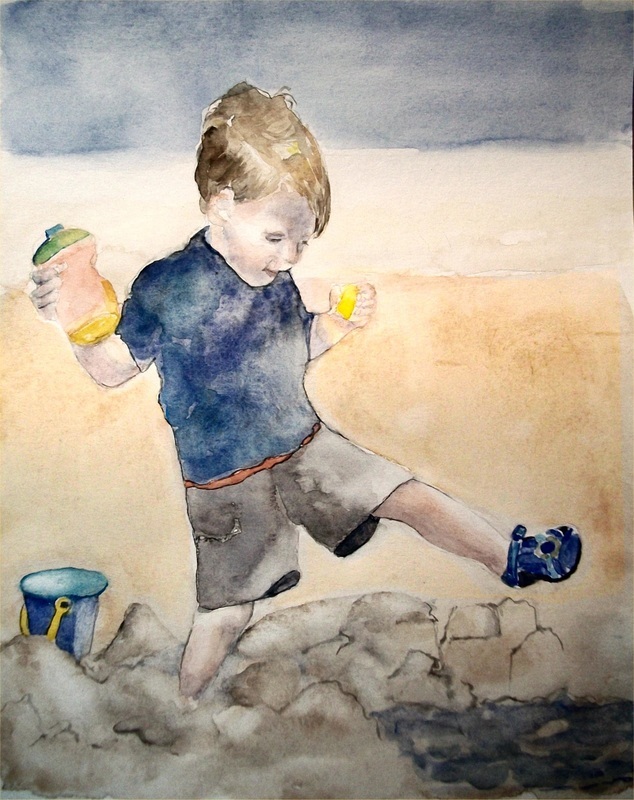 I like the sheen in the sand from Izzy's right front foot, creating a kind of reflection! 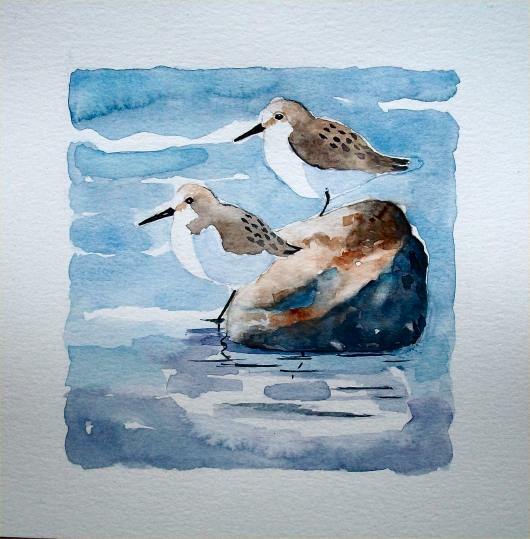 I also gave the sandpipers a slight reflection in the shallow water. "Hi Karen, it arrived! It's more beautiful than I imagined. I will take it in for framing after Easter. I will send you a photo once it's done. I just love it. Thank you so much . Have a happy and blessed Easter and Passover.......I saw the little item on your front door that my Jewish friends have. I assume you and or Roger is Jewish.....season blessings either or both ways." On our way south this year (2014) we stopped in NC to meet my client, Mayme. What a lovely, interesting visit we had and she is such a nice person! 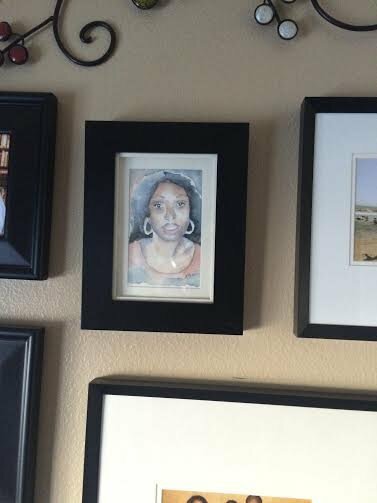 David, her husband, was called away but she showed us into his office and I got to see the groupings of my paintings, all matted & framed in his outer & inner office. Roger took pictures and I hope to soon post them here. It was a wonderful experience for me to do the commissions for them and then eventually see them hung on the office walls! Thank you Mayme & David! I love it! To be honest the red roof kind of threw me, but I like it. 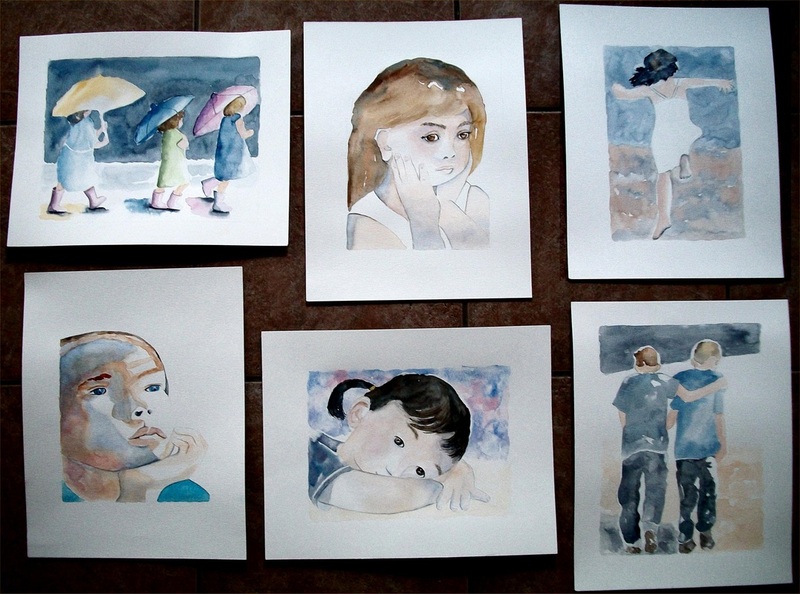 I immediately looked at the picture I sent and compared them and really really like your painting very much! It has a reddish tint to it and it does help with the "whimsical" look. I am at a friend's home on Kodiak Island at the present time.He starts up his generator and uses satellites to get the Internet, he is so remote.The true Alaska, took a float plane (Dehavilland Beaver) out here from the town of Kodiak. We are in Village Islands up in Uganik Bay if you would like to look it up on the web. Each year I come here (have a small cabin) and stay with my friend Steve who lives here year round and commercial salmon fishes. It is truly amazing. We are allowed to harvest 3 Sitka black-tail deer each year, which I then live on the rest of the year.There is deer stew on the stove and soon we will have a hearty meal. The above painting of the little girl in pink was a commission painted from the picture beside it. 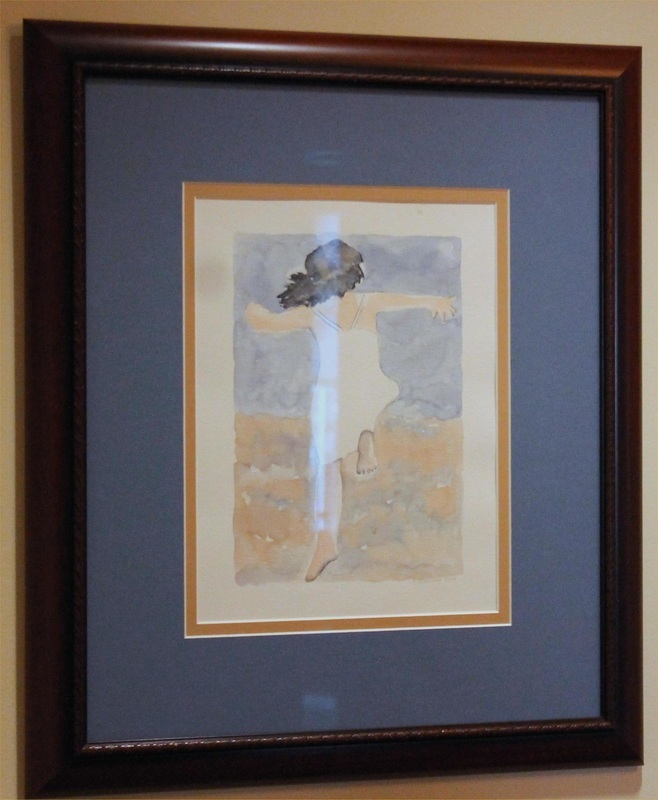 The painting below is also for the same client and was painted from the picture also beside it. 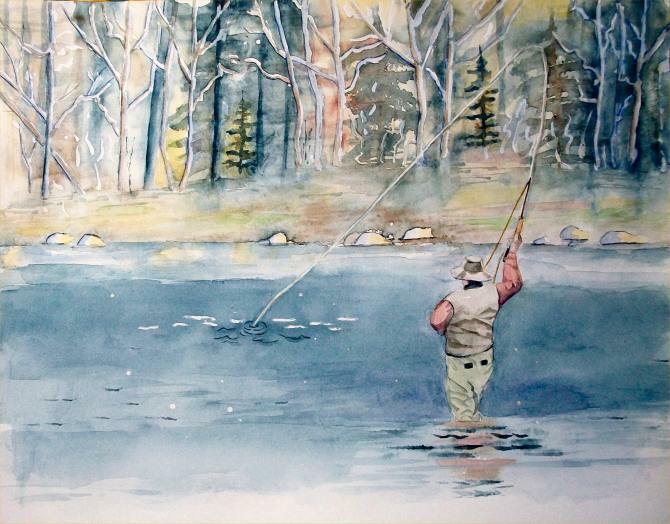 ​ I painted this 11" x 14" fly fishing commission of a client's father, as a Christmas gift for her mother. Below is the photo I worked from. Hi Karen, I have consulted with my siblings and we would be so pleased if you would do us the honour. We really liked the idea of a more fluid/watery painting. I have finished your painting. It’s interesting, but I realised pretty quickly that the brilliance of the fall colors should be toned down, to preserve the focal point of the painting...which is your father of course! : ) It’s a gentler tonal study and I hope you like it. 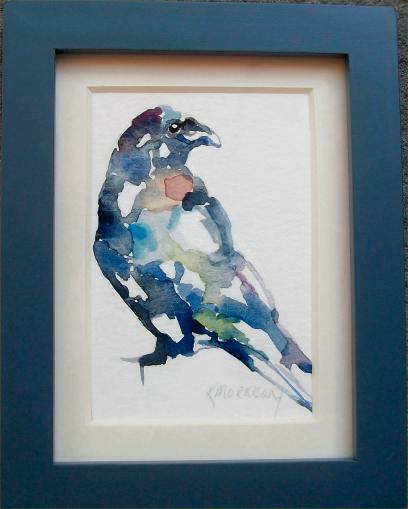 I think the painting would look lovely framed with a white/cream mat. Hi Karen, I have polled the siblings and we love it. Very well done. You have captured our father perfectly - colours, posture, proportions and lack of a behind. 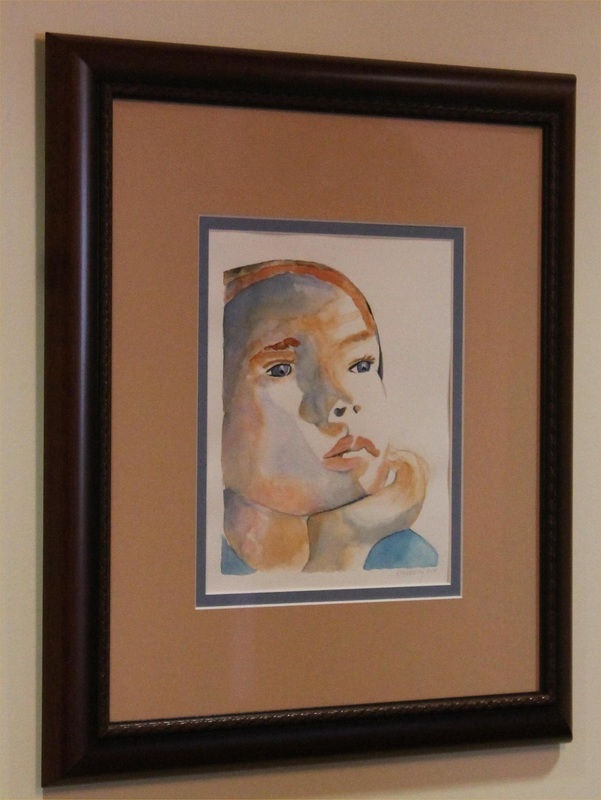 Hi Jessica..So glad to hear from you and know that you & your siblings are happy with the painting. It was a pleasure for me and very touching to know that this was your fathers last day of fishing. 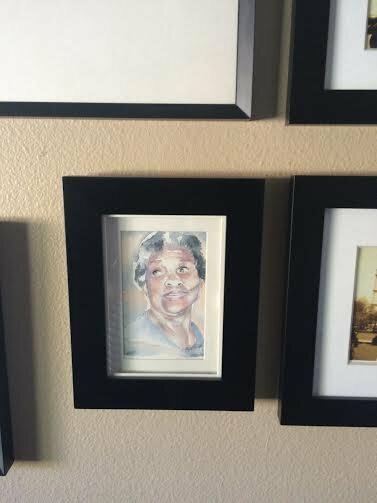 I hope your mother will love the painting and I truly think a white mat and silver frame will really set it off. Many thanks again for this lovely opportunity to paint your father in a sport that he loved. : ) Have a wonderful Christmas! Above is my impression of the beautiful village of St Ives in Cornwall. We visited there this past October 2015! I decided to try painting it. 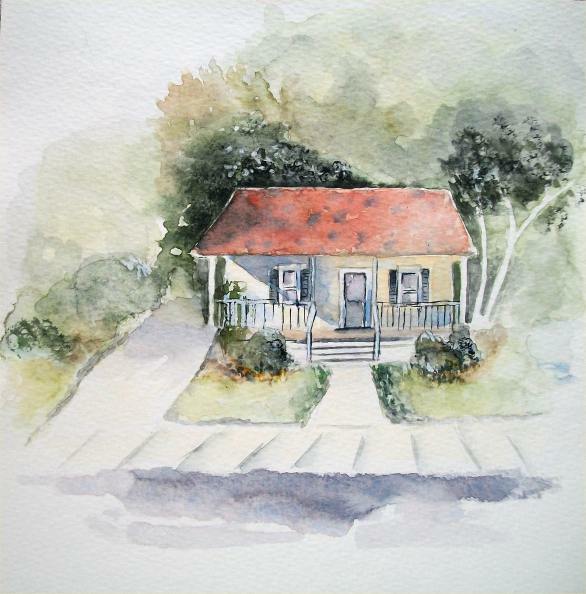 This is a 9" x 12" watercolor. 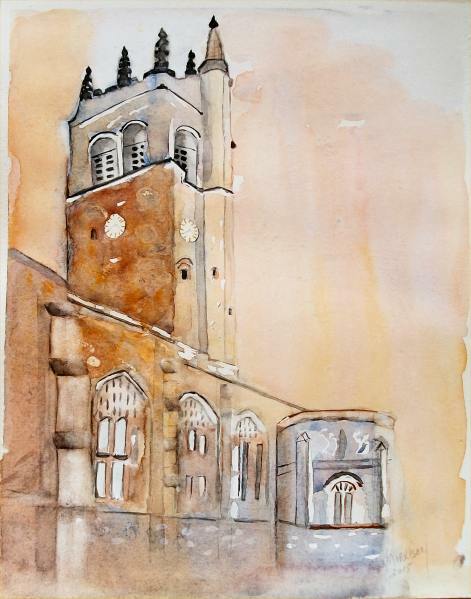 Above is a painting I did of All Saints Cathedral in Hertford England.